Approximately 200 people gathered at 24th street and Bryant streets on Wednesday July 1st to rally in support of a Latino/Chicano Lesbian, Gay, and Transgender Mural by Manuel Paul, titled "Por Vida," that has been vandalized multiple times. The latest incident was arson. 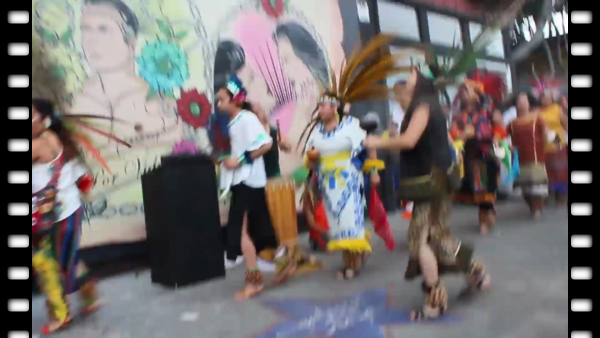 Galleria De La Raza hosted the rally which featured Aztec Dancers, and supervisor David Campos weighed in on what the vandalism of the mural meant to him as a Latino man. The community is trying to make sure the vandalism does not define who they are, and does not divide the community. Queers have been living in the Mission since it's development, and the community wants haters to know "they do not "reflect the values of that community." The latest incident was arson, and the fire could have displaced the people living in the building.